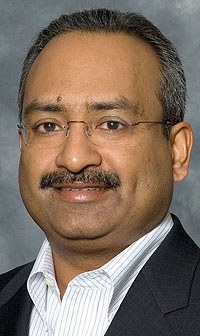 Tennecos Hari Nair expects to see financial benefits from the companys CO2-reducing products from 2010. Emissions control and ride control supplier Tenneco expects to make money this year in Europe. "The outlook, despite the current environment, [is that we] will be profitable in 2009 [in Europe]," Hari Nair, Tenneco's boss for Europe, told Automotive News Europe. The company will report its fourth-quarter and full-year earnings for last year on Thursday, February 5. If the company's nine-month results from 2008 are any indication of what to expect for the full year, Europe will play a major role in the company's success. Through September 2008, Tenneco reported global earnings before interest and tax (EBIT) of $142 million (about 101 million euros at the time) on sales of $4.71 billion. Most of that EBIT -- $97 million -- came from Nair's business area, which includes Europe, South America and India. He also is in charge of Tenneco's Asia Pacific business. In the third quarter of 2008, the company's European operations benefited from new business with Volkswagen and Mercedes-Benz. Both automakers are using Tenneco's Continuously Controlled Electronic Suspension. VW offers it on the Passat and Mercedes fits it on the C class. Nair also is bullish about the company's prospects for the next five years. The reason for his optimism is that the development cycles for Tenneco's new CO2-reducing technologies are nearly complete. He expects to see financial benefits from those products between 2010 and 2012. The products are supposed to help automakers meet new regulations that require automakers to lower their emissions. Although he is positive about the future, Nair concedes that Tenneco also is being affected by the global economic slowdown. The company said it will record about $31 million (currently about 24 million) in restructuring charges in the fourth quarter of 2008 and in 2009. The changes will result in $58 million in savings. Auto suppliers around the world are hurting because automakers are reducing orders by up to 50 percent to cope with sharp drops in new-car sales. In response, partsmakers are cutting projects, employees and plant shifts. Tenneco, which is based in Lake Forest, Illinois, makes exhaust components and systems, shock absorbers, struts and suspension systems and elastomer products. Including aftermarket volumes, the company reported sales of $6.2 billion in 2007 and an EBIT of $252 million. Europe, South America and India accounted for $99 million of the global EBIT.